The Mammoth Mountain Bike Park operates during the summer months, and opens when snow and ice are no longer a danger. 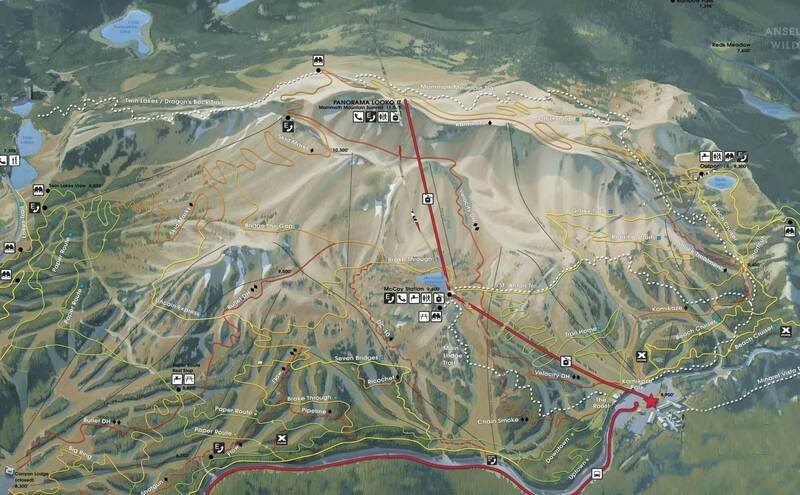 This is a printable version of the official Mammoth Mountain Bike Park Trail Map from the resort. The buses in town, and the chair lifts are equipped during the season to help you load your mountain bike and get it to the top, so you can enjoy the ride down! The peak elevation is 11,053 Ft at the top of Mammoth Mountain Summit. If you're coming to Mammoth in the summer months to do some riding, you may want to stay near Canyon Lodge in nice Mammoth condos. You'll be able to ride off the mountain and right to the front door. And in the morning, continue downhill to catch the bus back up to Main Lodge where you can start all over again.